Robbins egg blue top stitched jeweled shoes. They have 3 straps on the outside of the toe and wrap around ankle straps. Red metallic leather ankle strap shoes with jeweled ankle straps. Strappy metallic look slide with high gloss heel. 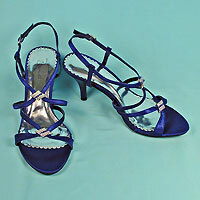 Royal blue satin strappy evening slippers with clear and royal rhinestone clips. Metallic finish faux leather strappy shoe with rhinestone decoration across toe. Color: jade. Hue: jade green. color code: #33FFD6. 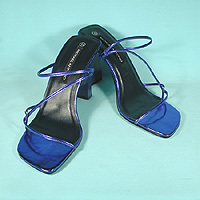 Satin ankle strap shoes with metal ross and sequined design across toe. 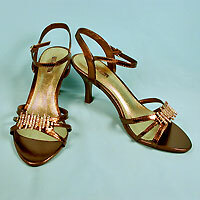 Brown metallic shoes with rhinestone trim across toe and ankle strap.